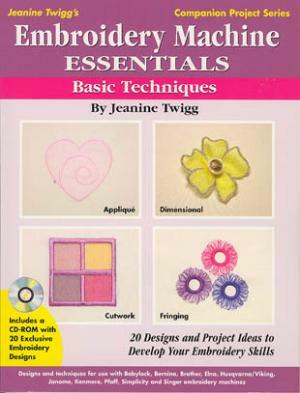 Based on the best-selling book, Embroidery Machine Essentials, Basic Techniques is the first in the Companion Project Series by Jeanine Twigg. Packed with easy-to-stitch techniques and project ideas, Jeanine is paving the road for embroidery sucess with the Companion Project Series and her innovative ways of looking beyond the "face value" of decorative designs. The 20 exclusive embroidery designs located on the CD-ROM were created by Jeanine specifically to show a variety of basic embroidery techniques. These 20 designs have over 65 stitch variations. From Applique to Fringing, Jeanine will show you innovative ways to use the designs in projects from home decor to clothing. Then, once you've mastered these basic techniques you can venture into the world of decorative designs knowing how to use a wider variety of designs for embroidery techniques.